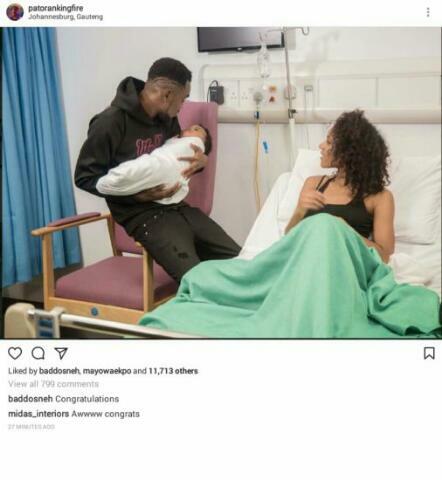 Patoranking & longtime Girlfriend welcomed a new born baby today in South Africa. Patoranking & longtime Girlfriend welcomed a new born baby in South Africa. The singer made this known via his twitter handle as he shared photo of him carrying the baby. Though the photo he shared came with no caption, however it confirms our earlier report of being the latest dad in the Nigerian entertainment industry. Recall that Patoranking shared a photo of himself and a mysterious pregnant lady where he wrote on the caption, “Daddy yo”. He has now joined the likes of olamide, dbanj, DJ Enimoney who are babyfathers.